Red squirrel sightings in the north east have increased in recent years after the launch of a project to protect the animal. Saving Scotland’s Red Squirrels, the largest project to protect the rodents in the country, believes that the increased sightings are a positive sign. Mel Tonkin, project manager the red squirrel initiative, revealed that the animals have been spotted in areas of Perthshire and Aberdeenshire for what is believed to be the first time since the project was launched two years ago. 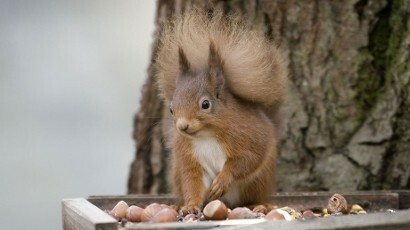 “This project is the first strategic approach to red squirrel conservation ever to be attempted in Scotland. “By channelling resources to priority areas in our aim to protect red squirrels by halting the spread of grey squirrels, we are making encouraging progress. “Most excitingly, since the start of the project, red squirrel sightings are being reported to us more frequently in some areas, such as Dunkeld, Meigle and Alyth, and red squirrels have also been spotted in other areas, like Stoneywood near Aberdeen, for the first time. Saving Scotland’s Red Squirrels has also released a list of some of the best places to see the rare rodent, including the Carnie Woods near Aberdeen, Haddo House in the Borders, the Queen Elizabeth Forest near Aberfoyle and Blair Atholl in Perthshire.